In this Paragon guide we provide you with an overview of Jungling and how to go about it effectively. In this beginners guide we provide you with all you need to know about Paragon to get you started. In this Khaimera build guide, we provide an overview of his strengths, skills, matchups and card choices. Iggy & Scorch is my most played Hero and the first I reached Master rank with. He's an unrivalled lane bully that can use turrets and his Oil Spill to create large areas of denial. Thanks to his ability to plant three automated turrets, he can protect an area easily and push down a lane with great speed. Even with just one turret active, minion waves die quickly, allowing him to rotate lane or push on to the tower. Iggy & Scorch are an inseparable pair that just want to set the world on fire. Together, they are powerful casters that control areas and dominate lanes. Iggy & Scorch thrive on setting traps for enemies and lighting them up with oil and fire. The fact his kit comes with a strong Ultimate ability (Flame Belch), alongside an invaluable escape (Oil Spill) make him a versatile but highly offensive Hero. What's also particularly useful about Iggy & Scorch is the fact that they don't need to build damage to be valable: he can build huge amounts of defence and still deal reasonable damage. Unfortunately for Iggy & Scorch however, the speed of Monolith combined with his static nature of play has seen him fall heavily out of favor. Both were cast-out as runts. Suits them just fine. Scorch once ate all the molotovs, passed out, and burned down an orphanage. Iggy thinks he's a dinosaur. Scorch disagrees. Molotov (LMB) - Iggy relies heavily on his Molotov in order to damage minions, Towers but to also ignite his oil. Although its range is short and damage low, it provides his only form of reliable poke outside of his turret. Although Molotov provides light burning damage to anyone it hits, numerically it's very low and is simply a passive effect of its direct impact. In essence, you want to be constantly using Molotov to ignite your Oil Spill when in lane while also last hitting as many minions as possible. Tip - Any skill that causes fire can ignite your Oil Spill, but Molotov is mana free, providing you with much better lane sustain than using a turret or your Ultimate to do the work. Oil Slick (RMB) - As your only means of quickly escaping or engaging an enemy, Oil Slick allows Iggy & Scorch to place a trail of oil behind them as they run. You're then able to ignite this slick, with any enemies who came into contact with the oil suffering burning damage. Its damage is negligible and the value of the skill is in the speed boost you receive while running. Tip - Running backwards in Paragon is the same speed as forwards. Face your enemy when using Oil Slick so the trail is in front of you, allowing you to easily ignite it while still throwing Molotovs. 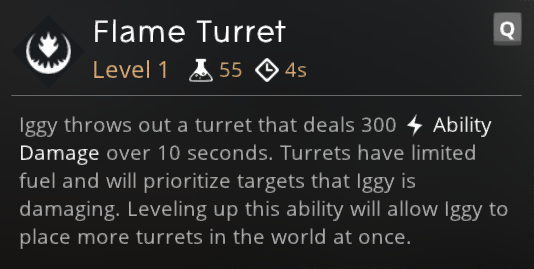 Flame Turret (Q) - The primary reason why Iggy & Scorch are strong at holding a lane is their ability to lay down turrets. At a relatively cheap mana cost (55 per turret) he can lay down three at a time. By default he begins with one and gains an additional charge per upgrade up to a maximum of three once it has been upgraded. His turrets will automatically attack anyone in their radius and will prioritize Heroes over minions. Lasting for 12 seconds, they'll eventually explode when out of fuel, requiring Iggy to throw down another. With a three second cooldown to place each turret, you can't scatter-gun them. However, with cooldown reduction cards or careful planning you can easily maintain three at once. Tip - Be aware that if you have active turrets in a lane and leave that lane, they'll power down. Returning to the lane will turn them back on before their duration is over. Oil Spill (E) - Your primary form of burst damage, Oil Spill allows Scorch to fire a blob of oil. When it lands, any enemies caught in it will be coated in oil and if it's ignited, they'll take a single spike of damage. With a relatively long cooldown and a mana cost that isn't neccesarily cheap (around 100 per cast) it's not a skill you can afford to waste. Unsurprisingly and due to its burst, it's excellent for wave clear (Oil Spill > Flame Turret) but also invaluable in a team fight if you need to poke one or more targets. Considering Oil Spill has a longer cast range than your Flame Turret you'll often have to ignite it with your Molotov or cast it short. Tip - Using your Oil Spill just in front of your Flame Turret while in lane - against oncoming minion waves - allows you to clear them incredibly quickly. Your Oil Spill will ignite once your Flame Turret begins to fire, dealing high damage to the ranged minions out of its reach. Flame Belch (Ultimate) - Flame Belch causes Scorch to breath fire in a cone in front of him. At the end of the cast, Scorch will knock players back. What's particularly powerful about Flame Belch isn't just its damage (which is high) but the fact that its cone is wide enough to hit multiple targets. Should you wish, you can also double-tap the skill to trigger the knockback early. This can be invaluable if you're being attacked (but stand no chance of winning the fight) as it allows you to quickly gain space before using Oil Slick to sprint away. The one thing you have to be aware of when it comes to using Flame Belch is that it has a short range - be sure that you're close enough to the enemy to gain maximum damage from it. Tip - You can use Flame Belch to knock enemies into your tower. Sprint up to and around them with Oil Slick before double-tapping Flame Belch to quickly knock them backwards. There are a couple of variables when it comes to upgrading Iggy & Scorch's skills. You can either maximize your Flame Turret, followed by Oil Spill and Flame Belch. Or you can replace Oil Spill with Oil Slick. As it stands right now, the best course of action is to upgrade Oil Slick as it's your one and only form of burst damage. Iggy is a lane bully and arguably at his strongest early to mid game when holding the off-lane. He can comfortably push any lane, even if he only has one Flame Turret and unless paired against another Iggy & Scorch, should be freezing a lane with ease outside your Tower. Be aware that despite being able to bully your way down a lane, you'll only bring a Tower down if your team come to your aid to outnumber the defending enemy, or if they're forced to recall/rotate to defend another lane. Once you've pushed a lane early game, be sure to back for cards or rotate to the mid and right lane to help push them out. Once the first enemy Tower is down across any three lanes, it's imperative that you begin to rotate. Pushing alone down a lane when two or a single enemy Tower is still standing is incredibly risky. Your Oil Slick will only provide you with so much survivability and Iggy thrives on stretching the enemy. Hypothetically, if the left Tower is down you should rotate right and mid to push the lane and secure it. Ideally, you also want to be collecting the Black Buff as often as possible so that if you find yourself out-rotating the enemy and on a Tower, that you can bring it down quickly. At this point in the game you should be supervising lanes. See one that the enemy have pushed past the half way point? Rotate to it and push it out before returning to join your team. Your value in a team fight, at this point in the game, is to provide Flame Turret protection for your team while charging into a team fight with your Flame Belch. Preferrably you want to be fighting on the wings (rather than in the middle of the pack) so that you can scatter your Flame Turret's but to also get good angles on your Flame Belch and its knockback when possible. Finally and if a fight is taking place on the opposite side of the map but too far away for you to get to, simply push the lane as fast as possible. These god threat levels (1 being lowest threat and 10 being highest threat) are to help you determine which enemy gods can give you a headache. For the gods listed here, take extra care as they're particularly dangerous for Iggy & Scorch. Dekker: Simply because of her ability to slow, stun and trap you, she's a threat. She can stop your Flame Belch, prevent you sprinting with Oil Spill and generally be a nuisance. She won't kill you 1 on 1 but she's incredibly annoying. Grim.exe: His slow is incredibly annoying and when he's late game, the combination of damage and crowd control make it very challenging to fight him. Riktor: His pull combined with his Ultimate ability and silence can make life very miserable for you. In a team fight, he can single you out and there's little you can do. Grux: Although you can comfortably build resistances against him, Grux and his pull are frustrating to fight against. It pulls you out of position, forcing you to use Oil Spill to try to escape. You'll take some damage in the process. Khaimera: Simply because of his burst and self sustain, Khaimera falls into similar territory as Grux. His leap and Ultimate combo at the very least keep you in place a little too long for comfort. This list of tips and tricks are just a handful of things we think will help your Iggy & Scorch play. We'll continue to add to the list as required and if you have any tips you'd like to share, let us know in the comments below and we'll place them here. 1. Iggy & Scorch are unrivalled for pushing a lane. Use this to your teams advantage before calling them to help you take a tower. 2. You don't need to cast more than one Flame Turret to dominate a lane. One will suffice. 3. When your Flame Turret is about to expire, it will make an audible "beep". Use this notification to prepare to drop another. 5. When your team is advancing, there's little value in dropping Flame Turrets. The fight will quickly move past them. Save your mana and only drop them when you know you'll fight in a set location for a period of time. 6. When pushing a lane, ensure that you don't meet the enemy minions before yours. This will cause you to be "noticed" by the enemy minions and appear on the minimap. Stay near yours, and let your minions be greeted first. 7. Iggy & Scorch can quickly run out of mana if you rattle through all your skills, dropping Flame Turrets randomly. You don't need to do this - focus on using your Molotov and just one Flame Turret until you truly need something more. 8. Iggy & Scorch are strongest when fighting in confined spaces so players can't escape their Flame Turret's. If you see a fight about to break out in the jungle, it might be worth getting yourself there. 9. Don't forget that your best form of defence is Flame Belch quickly double-tapped to knock players back before sprinting away with Oil Slick. 10. Be sure to always secure River Buffs so that you never run out of mana.